How is the lift performing? Have you had it out wheeling? Snarf has been away on vacation.... He defiantly owes us an update. Can't wait to see how Metal Cloak is performing over the months. I saw a guy at a jeep event this past weekend, who loved his Metal Cloak LCAs. I do owe an update. I've had this off-roading only once since completion. I qualify off-roading as driving a trail that most 4x4s could not pass through un-assisted and that would challenge a stock jeep/driver. I went up to PA and spent a day running her around to see how she flexed and climbed. Overall..I'm impressed. Having wheeled my stock jeep Rubicon many times - I was super thrilled at NOT having the "crunch" noise I was so used to when the skids bashed a rock. Thank you KM2s. Where I was wheeling, I didn't have the ability to air-down and back up..so that definitely limited some of my capability as I was wheeling on steep hills, over big rocks..at street pressure. The gamechanger flexed without any real effort on my part. I just picked my lines and the lift did its job. I know that sounds a bit silly..but the fact that I didn't have any binding or swaybar issues, or odd noises was great. The thing flexes a lot. In fact..I think my bump stops are preventing my full ability to flex and tuck these KM2s. 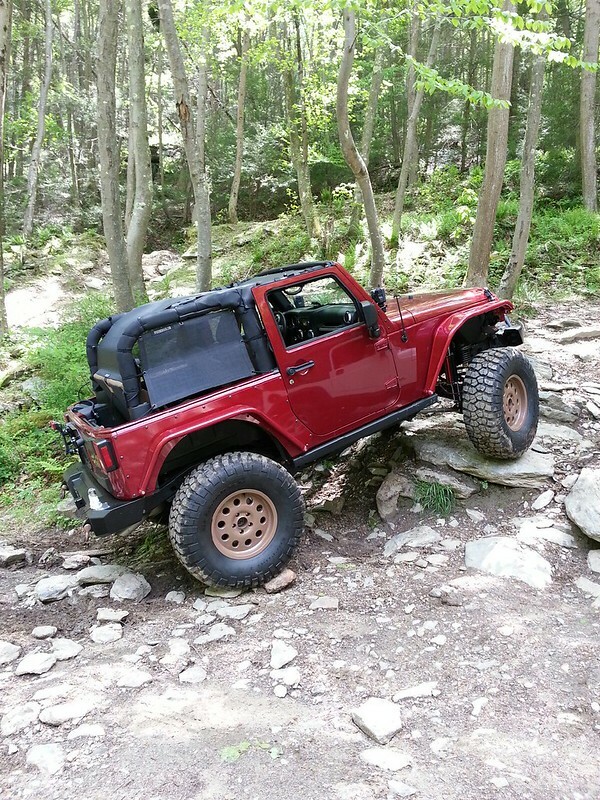 I plan on heading up to Rausch Creek at the end of the month where I will air down and spend the day wheeling with some local jeepers in my area. Aired down, I plan to get some better idea of if I can remove a section of bumpstop without ripping off my overline fenders. I also need to make sure that my tire does't touch the front 6-pack shock under full compression. Interestingly, my buddy Jeff now refers to each 6-pack shock as a "box-o-shocks" which is kinda catchy, and fairly accurate...since each has 3 pistons, and 3 reservoirs. SO far I'm loving it...and i"m loving the simplicity. The on-road handling is much more gentle over bumps and much more level around turns. Very happy with my investment. We should do a JeepLab Rausch Creek Trail ride! I'm in, whenever you guys are. Wow, you have lots of articulation there! I know! Its very impressive, especially for a 2 door. I can't get over how well a fully bolt-on Metalcloak Gamechanger suspension allows for this kind of off road performance while I say more level around turns on the highway at speed. Just boggles the mind! I have to figure out if I can take out a section of bumpstop without a tire hitting the overline fender. I got to admit, I'm really digging your fenders too. They look rugged as hell, have you ever laid your fenders up against rocks? No - they are still too pretty for me to NOT try to avoid hitting rocks with them I have NO doubts they would hold up fine as they are beast. I did run through a bunch of trees, brush, and whatnot. I"m not really concerned with the xpel wrap on them. Stuff is amazing. Fenders are pretty stout! 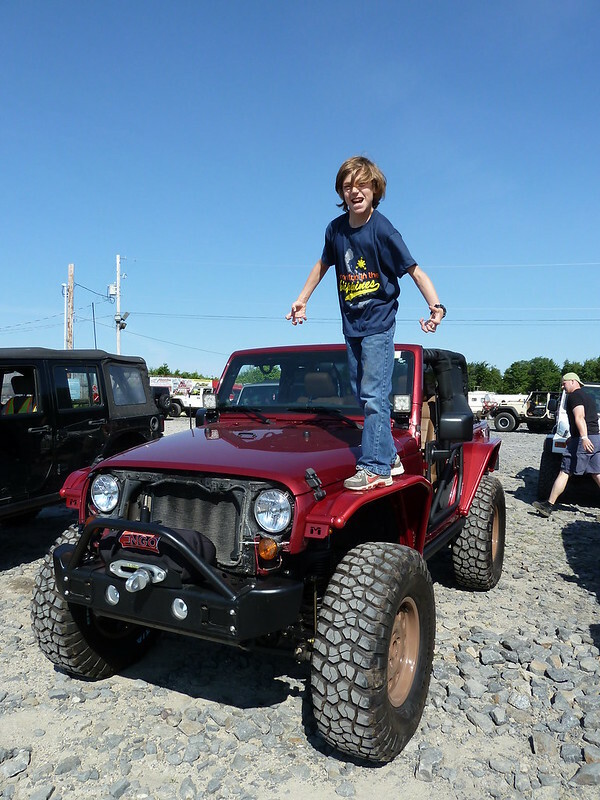 Don't try this with non-metalcloak fenders! Do not lay those flares on rocks, Ive done it, its not fun. And its expensive. Can you take them off all together? don't they have like a bolt inside that takes the outer section off for aggressive wheeling? Updates on the MC suspension after a year of driving please. Its been more than a year and she's going strong. The on-road performance is still vastly improved over stock and the off-road performance is stellar. I'm removing more bump stop to get more flex now that I'm comfortable with what she'll do. The winter road salts have taken their toll on the underside of the jeep but that happens to everyone. I use my jeep, so I don't care so much. I had to re-pressurize my 6-pack shocks after 9 months or so, but that was expected and MC has a guide on their site on how this works. So, very happy after a year. Glad I made the investment. I'll second Snarf's comments. I don't have the full game changer setup like Snarf has, but I did purchase their control arms recently and I have to tell you, the Jeep drives like a dream right now. It is unbelievable how tight the Jeep feels. It doesn't rattle around on the road. Their arms with their special bushings do a great job of isolating out the jarring affect you get on rough roads. I had a friend drive my Jeep recently and he was dumbfounded at how smooth and well composed it is. I had the 2.5" GC with ARB installed in May. Very happy with this setup.